Banana Cue is one of the most popular street foods in the Philippines; it is made out of a deep fried banana coated with caramelized brown sugar served in a barbecue stick. Bananas used are the key element of this dish hence “saba” bananas (cardaba bananas) are the only option if you want to make one as the use of normal bananas would not yield the same result and will break down when deep fried. This so far is considered to be the best selling street food in the Philippines, and when you visit our nice country you will see this almost everywhere specially during the afternoon on the streets of Metro Manila alongside other great street food like kamote cue, turon, kwek kwek, isaw, fish balls, etc. A really good snack for those who have that sweet tooth! In a wok add enough oil for deep frying. Heat oil in medium heat. Add the bananas and deep fry for 2 minutes. Gradually add the sugar and put heat on low, medium low can continue to cook until sugar melts and coats the bananas. Move the bananas around to have it coated with the caramelized sugar. Remove from wok one piece at a time and skewer it immediately, let it cook in a wire rack then serve. I like Banana Q but I like Turon better. I wont try it real soon. OMG!! That’s deliciousness on a stick!! looks really really good! Mouthwatering dessert. Tempting!! !… What a pity they don’t sell saba bananas around here. I know it’s not the same, but I HAVE to try it with our bananas. 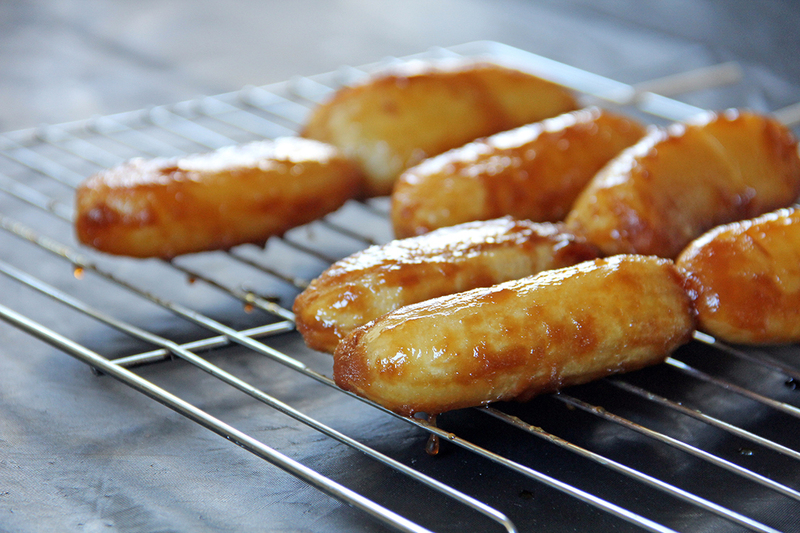 Fried bananas are one of my favorite treats! Too bad that I can’t get that variety of banana that you write about. Looks so delicious! When we were on an all-inclusive in Mexico, they cooked up something vaguely like this in a frying pan.. maybe that would work for those of us who don’t have the special bananas? They were sliced. I would love to try this one, you’ve used brown sugar and fried the bananas first which would be just fantastic flavor!! Mmmm….deep fried bananas with caramel sauce! I can see why this is one of the most popular street foods. Yum! Those are delicious looking Banana Q’s. Great photos! I have a couple of questions. Do you add the brown sugar to the oil? and if so, how much oil do you use? I wouldn’t want to use too much oil, because I wouldn’t think that the sugar would stick to the banana. But then I really don’t know. Have never made this before. 🙂 These look SO delicious and something I know I would LOVE to eat! Use an amount of oil enough for deep frying bananas, it should float, and yes it would stick once sugar melts. Oh yeah! This is the “bomb”! When I was in school in the Philippines, our cafeteria sold banana cue all the time. It was very hard for me to resist these fried sweet bananas! I think I gained 10 pounds in one year because of banana cue! Hehe. I didn;t know that the “Cue” came from the word barbe-cue until recently! Doh! I thought it was some sort of an incarnation of the Malay Kueh. Silly me! Going to try this when we go back to Manila in Feb. Yum yum. You have to drain it, oil does not stick very well on this type of banana so if youre worried it will be oily it not as you imagine. It wont be hard as well and sugar is just right, you can lessen it though to suit you’re taste. Yes it will but it will not be as hard as you might have imagined.